STOCKHOLM -- Chuck Ronson, a New York trader who's driven Saab cars since 2001, ditched the automaker last month when the lease on his sedan ended. "The brand is losing money, and dealerships are closing," said Ronson, who opted for a BMW instead. "Are they going to have money or not for payroll this week? There's too much uncertainty. I wouldn't buy a Saab again." Saab Automobile, the 64-year-old Swedish carmaker sold by General Motors Co. last year to Spyker Cars NV, is fighting to survive after halting production in March amid a payment dispute with suppliers. Following a series of starts and stops, the main Swedish factory has been quiet since early June, and the company has delayed paying wages twice as it scrambled to raise money. The market volatility caused by the European sovereign debt crisis complicates Saab's efforts to raise funds as banks become increasingly reluctant to loan money. With the factory shut down, the automaker's dealerships are going bust and employees are wondering about their future. "The chances have definitely narrowed," Martin Crum, an analyst at Amsterdams Effectenkantoor BV, said of Saab's possible survival. "The longer it takes, the harder it gets." The uncertainty has also hit the carmaker's stock. Spyker, which changed its name to Swedish Automobile NV in June, has plunged 69 percent this year, valuing the Netherlands-based company at 24.4 million euros ($34.7 million). New Salem Saab in Albany, N.Y., closed its doors Aug. 12 after 50 years in business. The "continual disruptions of the Saab brand and its operational difficulties" caused the demise, dealer president Darryl F. Carl wrote on its Web site. "It's definitely a tough, tough time being a Saab dealer," said Wes Harris, general manager of Dirito Brothers Saab in Walnut Creek, Calif. "A lot of the customers that are coming in that are Saab buyers are definitely nervous about the car company and what's going on." In Saab's hometown of Trollhaettan, nestled in southwestern Sweden along the banks of the country's biggest river, political leaders are already preparing for the possibility of life without the town's largest employer. Of Saab's 3,700 employees, 3,500 work in Trollhaettan. In total, almost 9,000 people in the region could lose their jobs in a shutdown, Paul Akerlund, the city's mayor, said in an interview. "We have discussed what to do if Saab fails, and we have a Plan B," Akerlund said, adding the town's current 10 percent unemployment rate would soar. Actions would include helping the unemployed get into university for retraining, he said. The river flowing through Trollhaettan powered local companies in the 1800s, laying the foundation for the industrial growth that's still evident today with the dozens of auto suppliers and other manufacturers surrounding the city center. The town of 55,400 boomed as Saab, which began making cars in 1947, gained a reputation for being offbeat, practical and safe. Innovations that defined the brand included headlight wipers, self-repairing bumpers and side-impact door beams. Saab, whose global sales peaked in 2006 at 133,000 cars, has been on a downward trajectory in recent years. The automaker sold just 31,700 vehicles in 2010, with deliveries suffering after it took months to restore the production flow because GM had emptied the factory as part of a planned closure. The brand has hovered near bankruptcy several times, including in 1989, the year before GM bought half of it. In December 2009, crisis-hit GM announced it would kill Saab as it did with Saturn, Hummer and Pontiac -- before Victor Muller, now Saab's CEO, persuaded GM to change its mind. "Everyone here is rooting for Saab," said Robert Henriksson, a salesman at Trollhaettan hardware store Industriprodukter AB, as he sold a fan belt to a Saab employee. Saab has aimed to sell 120,000 cars and become profitable by 2012. Those goals will be "re-evaluated" after Saab resumes production, spokesman Eric Geers said. Saab's focus now is to secure funding and negotiate terms with its 819 suppliers, Gunnar Brunius, the carmaker's production and purchasing chief, said in an interview at the factory. It may take a few weeks to restart assembly, he said. Swedish Automobile agreed in June to sell a 29.9 percent stake to Zhejiang Youngman Lotus Automobile Co. for 136 million euros. Pangda Automobile Trade Co. offered to pay 109 million euros for a 24 percent stake. Regulators and GM must still approve the deals. 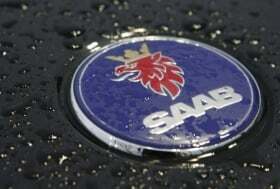 Saab also aims to secure a commercial loan and pay back the 217 million euros it owes the European Investment Bank in a move that would allow Russian banker Vladimir Antonov to invest in the carmaker. Saab has "great potential" if it can survive this crisis as it has developed more new models than ever, Brunius said. The 9-5 wagon should reach dealers shortly after assembly restarts, he said. The 9-4X, Saab's first crossover that GM's producing for the Swedish carmaker in Mexico, hit U.S. showrooms in June. Akerlund, who worked at Saab for 32 years before becoming mayor, is betting the carmaker will make it. "If anyone will survive this, it's Saab," Akerlund said. "Never count them out."